• Ken Sinclair with Ch Araki Wicked Willy, he was made a champion in just 3 CONSECATIVE SHOWS from his first award he won BIS at the TTBOC Championship Show 2008 & 2009 for the second consecutive year. 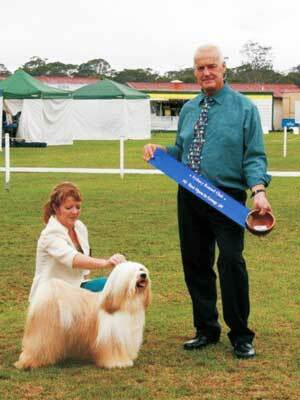 He has 9CC’s & was no2 TT from very limited show, due to Ken’s heavy horse/dog judging appointments in 2008. His 99% pure Araki breeding is the dog to use for gold pups with fantastic coats & outgoing Happy temperments like himself.